CHICAGO (WLS) -- Starbucks plans to build a new tourist attraction on Chicago's Magnificent Mile, which Mayor Rahm Emanuel's office said will be the largest Starbucks in the world. The company will take over the Crate & Barrel location at the corner of North Michigan Avenue and East Erie Street. 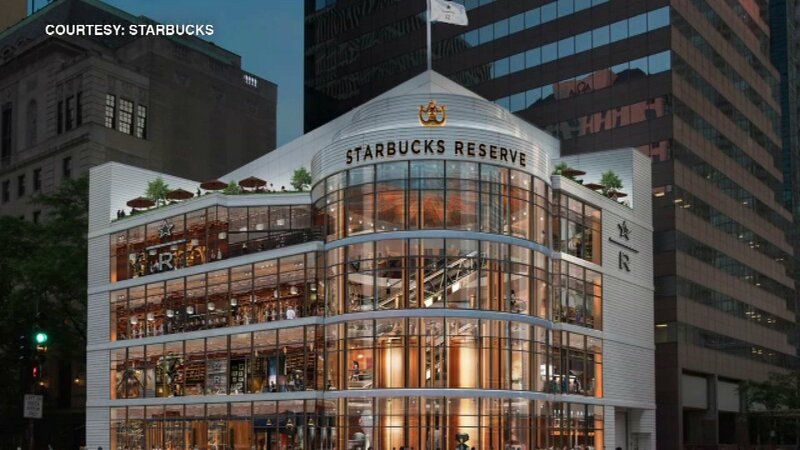 The mayor's office said the Starbucks Reserve Roastery will be a four-story, 43,000 square-foot interactive space designed to bring coffee craft to life. The roastery is set to open in 2019. It will be similar to the Starbucks Reserve Roastery and Tasting Room in Seattle, which opened in December 2014. Starbucks said visitors will get a full sensory experience as they learn about different ways the company roasts and brews its rare, small-batch Reserve coffees from around the world. The new space will offer a new menu of Reserve coffee drinks and mixology, as well as fresh baked-products developed by Italian baker Rocco Princi, who is known for artisan breads inspired by traditional family recipes. Other Starbucks Reserve Roastery locations are scheduled to open in Shanghai later this year, and in New York City, Milan and Tokyo in next year, the company said. Starbucks also plans to open a Reserve store, a retail location based on its roasteries, in Chicago's West Loop in 2018. The first Starbucks store outside Seattle opened in Chicago 30 years ago, the mayor's office said. Recently, Starbucks opened its first store in the city's Englewood neighborhood.